Author Arnold Bennett lived a busy life. He was a prolific English writer who moved to France and became a high-ranking bureaucrat. He also dabbled in film and opera, and had a rich personal life. 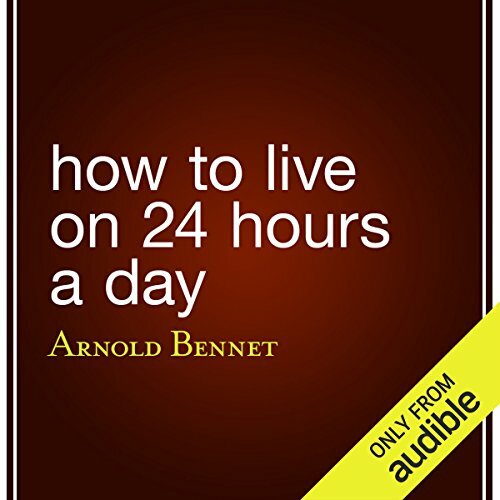 How to Live on 24 Hours a Day is chock full of Bennett’s tried-and-true advice. Bennett urges his audience to live authentic and ambitious lives. For Bennett, time is the great equalizing currency: No one can choose their allotment, or accrue additional time. So you must spend what you have wisely. Narrator Eric Brooks has an august British accent, and he expounds with the authority Bennett himself would have employed. Brooks methodically explains Bennett’s techniques for increasing concentration and self-awareness, both key tools to increase productivity and time efficiency. This classic personal time-management book, originally published in 1908, has inspired generations of men and women to live deliberate lives. Not just another collection of timesaving tips, this book is more of a challenge to leave behind mundane everyday concerns, focus on pursuing one's true desires, and live the fullest possible life. Reflection, concentration, and study techniques make it easier to accomplish more truly rewarding undertakings than anyone ever dreamed possible. Would you listen to How to Live on 24 Hours a Day again? Why? Yes. I liked the tone and the fact that it is a century old makes for interesting companrisons to life today. It was a pleasant read. We have to be at work for so many hours a week, but most people fritter away most of the remaining time. A little time each day should be set aside. An excellent if slightly dated discussion. The concepts and practices are not only still relevant and echoed in the productivity literature of today. The narrator is extraordinary and moves this work from literature into the frame of a discussion. It's just not worth it. I see it as obvious suggestions that appear in many self help books. Quality narration. Powerful content. Challenge accepted. Gripping prose. Timely, both from a personal lifespan but also does not mince words and clearly and concisely develops a plan and anticipates every counter argument. One may differ in regards to aspects of his perspective but one cannot argue with the premise and argument. Interesting how this holds up to modern time issues when the content is so old. Dated in reference but an instant, brief classic. The audiobook is extraordinarily narrated — often hilarious to this American married to a Brit, as I understand the vernacular and the cultural / geographic references. Though the book seems written for Londoners, any human in the Western world can benefit from its concise message, particularly city-dwellers. I would recommend this book to those persons seeking to develop better usage of their time. knowing how to manage it without becoming enslaved by a daily routine. There are too many simple ideas in this book. It makes this book boring and not intresting. Although the narration sometimes feels more like a comic novel, it actually suits the content of this book very well. The author uses a gently teasing tone as he delivers some rather serious and challenging advice on how to make better use of one's time. I loved it, and will certainly listen to it again! Yes I would relisten to this book and anticipate to do so often. The struggle I find in getting through the day and week. Thank you to this book for some great ideas which I am working on putting in to practice. The Best 1.5 hours of reading (listening) Ever! After 105 years in print I am amazed that it took me so long to find this book. It surpasses all of the time management books ever written. Move over Covey, Franklin and Carnegie this man is a genius. I loved the old literary "Jeeves" style of writing but it may put some people off. However, I encourage you to persist and focus on the core principles that Bennett is trying to teach. If you are fed up with having too much busyness in your life and you want to enjoy "living" on 24 hours a day instead of existing then I invite you to apply these principles into your life without delay.